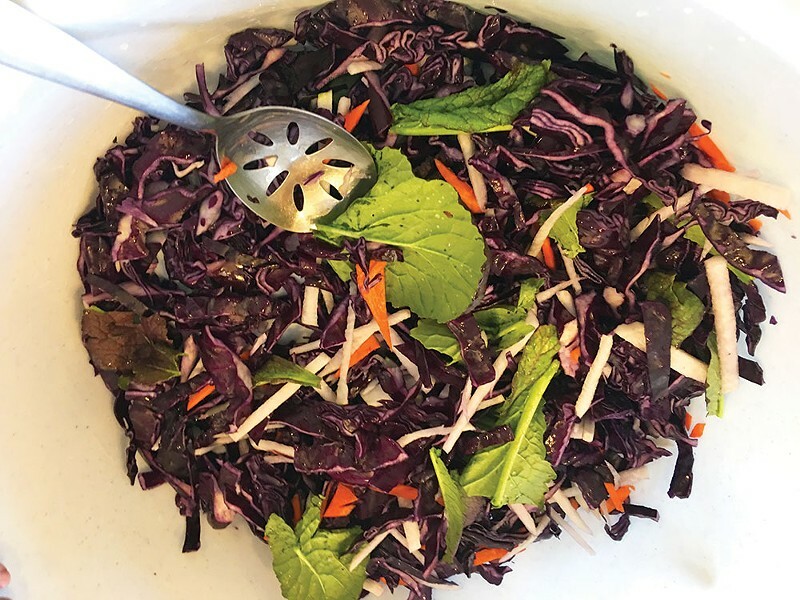 Shreds of crunchy red cabbage are mixed with daikon, carrots, and mustard greens to create a distinctive kimchi. The kimchi growers at Kimchee Harvest talk about starting their family business in the Hudson Valley. They also dive into the health and other benefits of the vegetable-based food. When Madalyn Warren offers samples at her farmers' market stand, she must sometimes explain what people are tasting. "I'll have four different types out to sample," said Warren, founder of Kimchee Harvest. "Then people will ask, 'Can I try the kimchi?' They just tried four different kinds of kimchi but they are talking about the most popular type, which is the Napa cabbage." Despite this common misconception, kimchi is made from a variety of vegetables—dandelions, ramps, turnips, turnip tops, radishes, cucumbers, rutabagas, green garlic, kale, arugula, rhubarb—and can include fruit such as apples, pears or peaches. 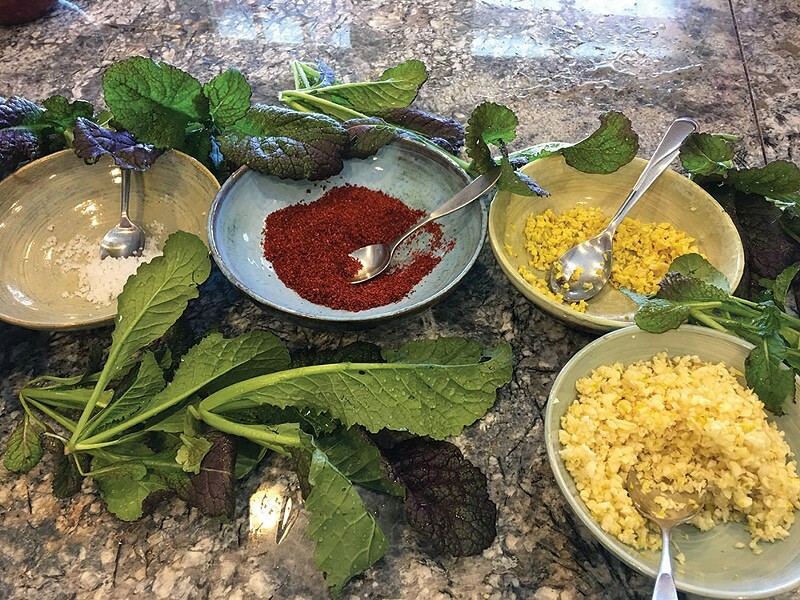 Growing various crops at East Branch Farms in the Delaware county town of Roxbury, Warren continuously varies her recipes for distinctive farmstead kimchi. "Rhubarb was fun because people are used to eating rhubarb in a sweet pie or cobbler. It was a really nice pink color, it was cubed and stayed crunchy. People were really into being able to eat rhubarb in another form." Kimchi has been fermented in Korea since at least 57 BCE, but the ubiquitous Napa cabbage variety is a relatively recent development. Early kimchis were mostly radishes salted in brine. It wasn't until the 19th century that chili peppers and Napa cabbage became common ingredients. 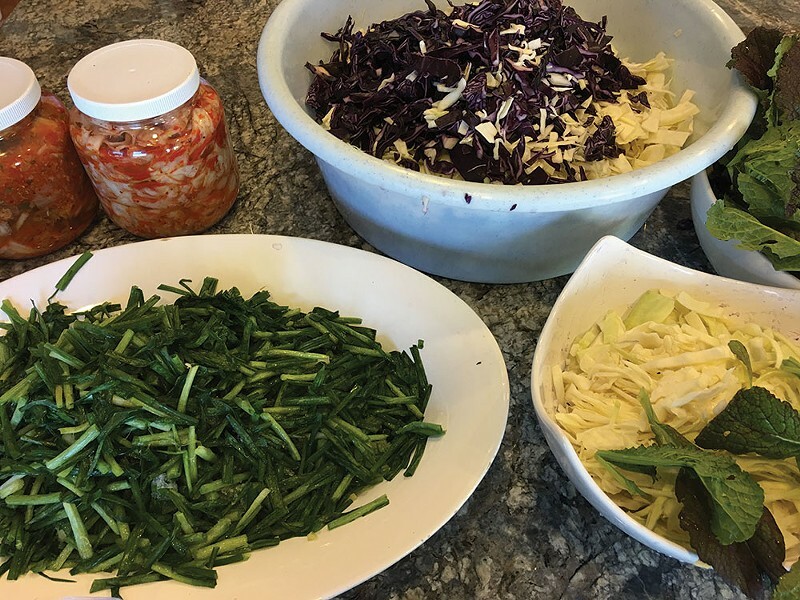 Although Napa cabbage kimchi is currently the most popular, it's only one of about 200 varieties eaten in Korea, many of which are regional variations. Warren's mother Ji comes from Busan, a city on the southwestern cost of Korea, where recipes make the most of marine ingredients. "Busan is right on the ocean, so they love throwing oysters and shrimp and everything from the sea into these amazing fermented fish sauces," said Warren. "They actually throw the oysters right into the kimchi itself." Warren plans to produce some oyster-ramp kimchi this spring. All versions of kimchi share similar basic ingredients—garlic, ginger, black pepper, hot pepper, fish sauce, sea salt, crushed apple, and honey—but don't worry if you're vegetarian or vegan. 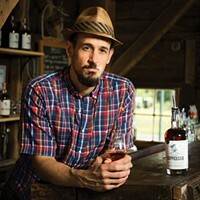 Some artisanal and commercially available varieties are made without fish sauce or honey. "For our vegan kimchi we use Roxbury Mountain Maple Syrup as a substitute for the honey," said Warren. "We add a little more ginger to those batches. This winter we started experimenting with seaweed, to add more flavor." Seaweed is also an ingredient that Warren uses for her organic farming. "I like working with seaweed and compost teas. I made a trip to Ecuador to do a farm stay and learned this technique of making compost teas. Good crop rotation helps too. Diversity is very important to me, so I grow a little bit of everything. 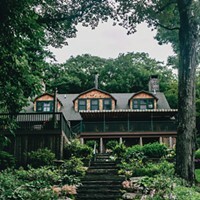 "Warren and her siblings grew up at an Adirondacks inn run by their parents. In college, Warren majored in political science and felt drawn to social justice work. Then farming beckoned. After visiting a friend's farm, she became excited about growing things, eventually settling at East Branch farm in 2012 and launching the family business. 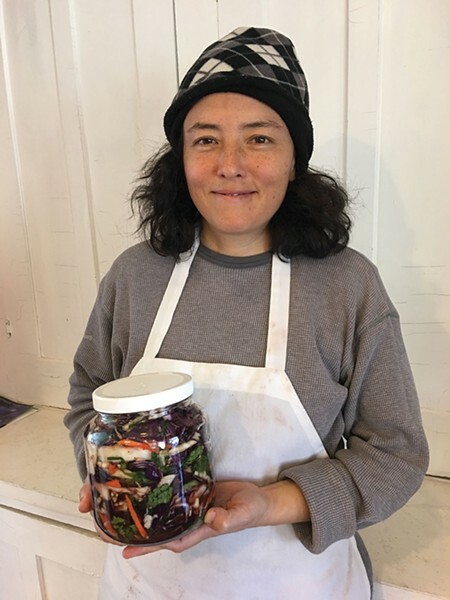 Madalyn Warren learned how to make kimchi from her mother Ji, but has adapted the process to get the most nutrition from her organic vegetables. "I really liked the idea of growing food. It seemed like a very effective use of my time. And taking care of the land. That made a lot of sense to me." The increasing awareness of kimchi's health benefits and her family's know-how intersected in a practical way. "Kimchi is a great product for a farmer. Any pickled vegetable is, because it adds a shelf life. One of the big challenges for growers is the shelf life of a product. There's a tremendous amount of pressure for people handling fresh herbs and vegetables, fresh fish, anything fresh. The challenge is moving it out and getting it into the consumers' hands as quickly as possible, so you're always thinking, 'How can I process this food so that it has a shelf life?'" Kimchi was conceived as a way to store food for the winter, but today it fills a different need, so the fermentation process has been adapted. Traditionally, the vegetables are heavily salted and sit for hours before being rinsed. The salt breaks down the vegetables and draws out the juices. The juice is discarded and then the sauce is added. Warren prefers not to heavily salt the vegetables but rather wash them four or five times, then lightly salt them, and layer with sauce. This results in more juice, but also preserves more nutrients. "The traditional process was about storing food for consumption in the winter months, so there's no interest in storing liquid. The technique of salting pushes out a lot of the water, so you can pack in as much cabbage as possible. We don't think that's necessary now. We all eat plenty every day of the year." These days, people need more nutrients. Traditionally, kimchi was stored in stone pots, settled into the ground, but today, ingredients fill glass jars and stay fresh in a dedicated refrigerator. "A lot of the food that's available to us is lacking in nutrients because the value system in growing and delivering fresh produce includes this shelf-life idea. Varieties are grown so that they can withstand a truck driving across the country and be sitting on the shelf at the grocery store for a while." Warren is used to eating kimchi with every meal, including breakfast oatmeal, so she's convinced kimchi is good for you, but she's also pleased that others recognize the health benefits. "About a third of the people who buy kimchi buy it for the medicinal value," said Warren. "It's amazing how many people are into it now because they are prescribed probiotics. They're having some gut issue so their doctor or friends tell them about sauerkraut or kimchee or kombucha, all these probiotic-rich foods. We have a very long digestive tract, 40-feet long, and studies show that the beneficial bacteria in kimchi survive the whole tract. A lot of the probiotics will not make it that far." Making your own kimchi is a good way to take advantage of the vegetables found at farmers' markets. "There are plenty of good recipes online and in cookbooks. The biggest problem people have when they make kimchi is that they over salt it. If they're using fish sauce, the sauce is mainly anchovies, salt, and water, so there's already a tremendous amount of salt in your fish sauce." Also, home fermenters should resist the urge to keep opening the jar. Kimchi does not like exposure to air. If your first attempts to make kimchi don't turn out as expected, it's not a waste of vegetables, says Warren. Toss those vegetables into a stir fry or fried rice or add them to a soup. Keep trying. Kimchee Harvest is very much a family business. Sister Jennifer, brother Arthur, and mother Ji work at the farm and farmers' markets. 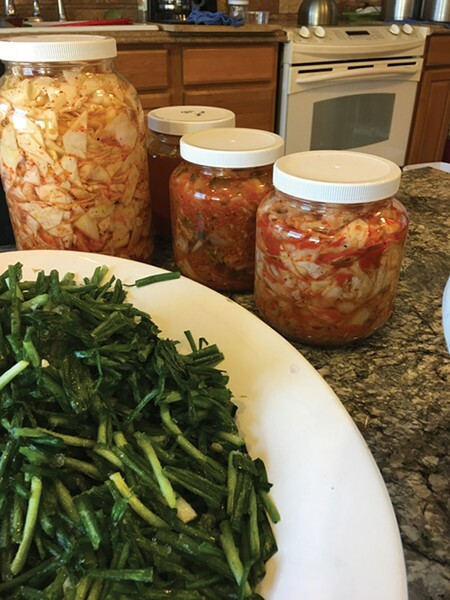 Ji plans to give a hands-on kimchi-making workshop at the Queens Mountain Inn in Roxbury and is currently researching prebiotics—foods such as garlic, Jerusalem artichokes, dandelion greens, and onions—that may potentially boost kimchi's already probiotic effect. Crunchy Jerusalem artichoke kimchi is also planned for spring. Salt, red pepper, chopped ginger, and garlic are the basic kimchi seasonings. 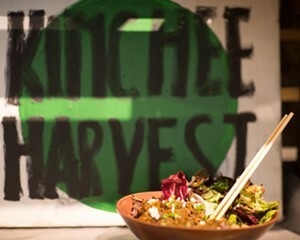 Kimchee Harvest sells its products at the nearby Patakan Farmers' Market, plus the Kingston, Union Square, and Tompkins Square markets, with plans to sell at the Fort Greene Park Greenmarket. Some of the farm's kimchi is delivered to restaurants, including Print, a Hell's Kitchen farm-to-table restaurant, and the Phoenicia Diner, where it's served as a special with pulled pork. It's unfortunate, says Warren, that those sampling kimchi at farmers' markets must do so without the benefit of rice and noodles. "At the market they don't have the rice to really taste it," said Warren. "Maybe the ginger hits them right away and that's all they taste. Maybe if they had some rice they could process the flavors better." There's a quick way to find out. Take a jar home. Cook up some rice, mix in the kimchi, and top with a fried egg, for a tasty probiotic treat. "UTTERLY FERMENTED: THE CRAFT AND BENEFITS OF KIMCHI"